At Nysmith School for the Gifted, we believe that education is an investment in your child’s future. As a family owned and operated school, we understand the sacrifice your family may make in order to afford a world-class education for your child. Our financial aid program helps to provide your child a quality education at an affordable cost. The financial aid program at Nysmith School for the Gifted is need-based. There are no merit-based scholarships or grants. 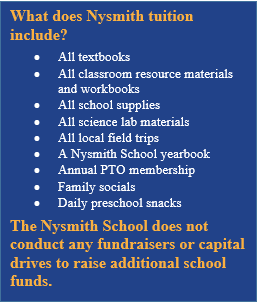 We encourage parents to explore the financial aid option when considering Nysmith enrollment for their children. We offer a several payment plans. Nysmith utilizes the services of FAST to help determine a family’s eligibility for financial assistance.